Paramus, NJ: May 5, 2017 — During the last few months of 2016, Armenia Fund USA began fully funding the Hanganak Elderly Project in Shushi, Artsakh. The project aims to help the most vulnerable part of the population, the elderly aged 63 and above, who are living alone in Shushi and its surrounding villages. These individuals frequently find themselves unable to obtain food and medical help due to their inadequate financial situations and poverty-stricken conditions. They live in isolation as they are unable to socialize with their peers and connect with the outside world. Hanganak Non-Governmental Organization (NGO) helps these individuals by improving their quality of life and providing them with the necessary medical assistance. Hanganak NGO was founded in June 2004 to support, both medically and socially, the elderly who live alone in Stepanakert, Artsakh. Doctors and nurses are available at the local medical center to provide healthcare services. If a beneficiary cannot make it to the clinic, the medical staff makes home visits to accommodate. Medication is also ordered by physicians for beneficiaries in need and similarly if a patient cannot pick it up, nurses will make a home delivery. Moreover, social services such as housekeeping, cooking, shopping, and more are provided to the beneficiaries in order to improve their daily living. Food provision is a main priority for this project. Most of the elderly will retrieve the food themselves from the office; however social workers and nurses will deliver to those who cannot pick it up themselves. Social activities are also organized, which include movie screenings, coffee hours, and trips to historical sites within Artsakh. Eye examinations and glasses are also provided to the beneficiaries who are in need of vision assistance. Since 2014, beneficiaries have received funding to cover their heating expenses during the winter season. Armenia Women’s Welfare Association (AWWA) has been actively supporting Hanganak NGO’s efforts in Stepanakert since the birth of this project. In April of 2016, Dr. Gohar Hovhannisyan, MD, MPH approached Armenia Fund USA’s Executive Director Lisa Stepanian to present the expansion of the Elderly Project beyond Stepanakert. Shortly after, Lisa Stepanian, Ara Vardanyan Hayastan All Armenian Fund’s Executive Director, and Vardan Partamyan Head of Projects and External Relations, met with Dr. Hovhannisyan, MD, MPH to discuss funding and finalize the launch of Hanganak’s vital activities in Shushi. There are currently thirty beneficiaries of the project in Shushi and only two of them live in its surrounding villages. Every month Armenia Fund USA ensures that all beneficiaries are receiving the necessary medical services, medication distribution, food provisions, and heating assistance. Currently, there is no centralized location in Shushi, similar to that in Stepanakert. For this reason, the elderly are receiving help from Hanganak in their homes. In the near future, the beneficiaries in Shushi will also get involved in social activities such as movie showings, gatherings, trips within Artsakh, etc. 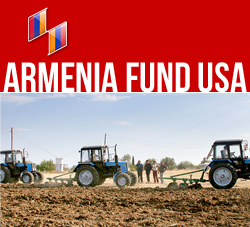 Armenia Fund USA hopes to garner the support of its donors within the United States for this project as it aims to support a significant humanitarian mission. 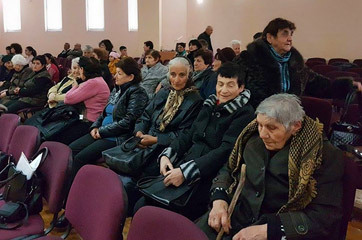 It is unfortunate that numerous elderly individuals living alone in Artsakh continue struggling to receive basic resources like food and medical attention. Hanganak NGO will continue to identify and help those in need in the regions of Artsakh.